I’m continuing my series of posts on this year’s crop of rose photographs with Rosa ‘Jude The Obscure’, one of the most wonderfully scented English roses. I haven’t got many decent pictures of this variety: this is about the best. 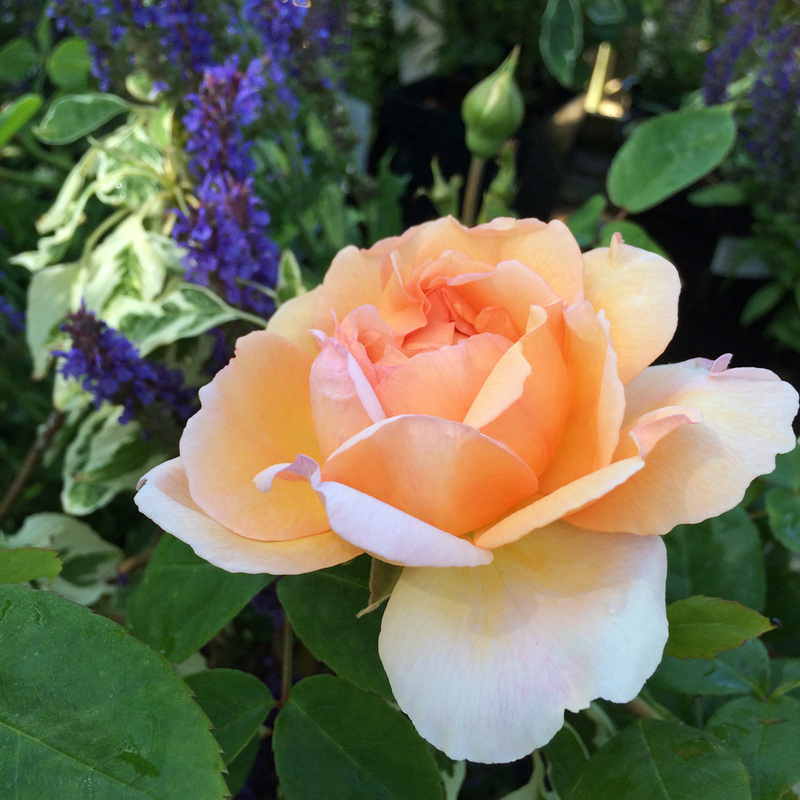 Regular readers may remember my passion for taking pictures of rosa ‘A Shropshire Lad’. 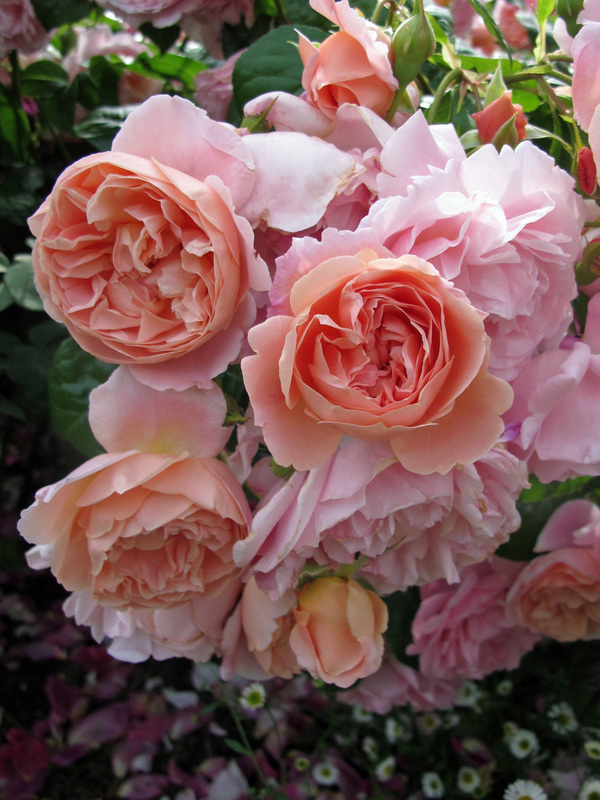 The reverse of the petals is a different shade to their fronts (a feature often found in David Austin’s roses). It creates an interesting effect in the centre where the petals are folded into a rosette. I know this shot is a little messy, but I love the tumble of blooms facing the sun. This rose is always true to its name: ‘Grace’. … and here the focus is on the deeper, younger dahlia-like blooms that are not yet fully open. I’m not too familiar with ‘The Lady Gardener’ though the odd times I’ve seen it growing, she’s always looked radiant, with sturdy, ruffled blooms. This is a side view of the same rose. I took these two shots of ‘The Lady Gardener’ during a visit to Burford Garden Company in the Cotswolds. I don’t get down there as often as I’d like, but when I do, this place draws me in, the same way a flower lures a bee. If American garden lovers fancy seeing a classic English garden centre when they’re over here visiting Hidcote Manor Gardens or Kiftsgate, it’s only about 25 miles away. 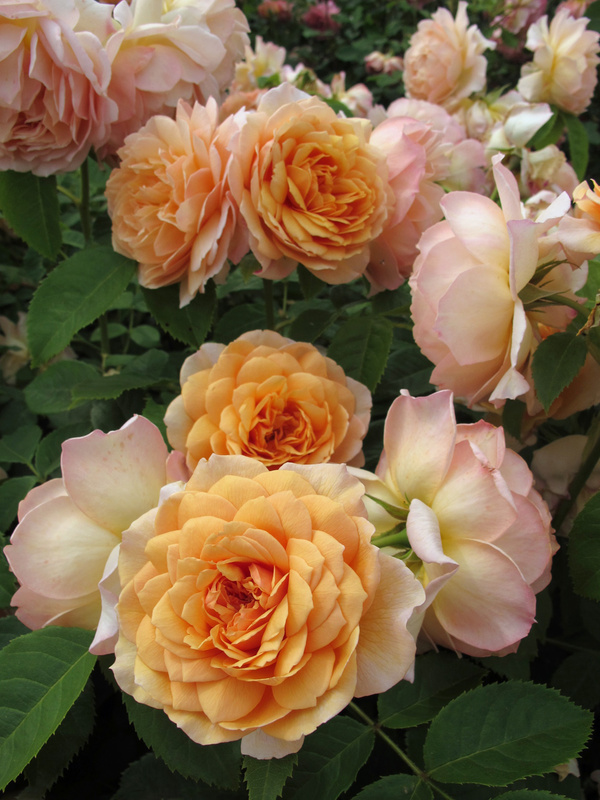 Rosa ‘Lady of Shalott’ (above) is a different beast, with much looser, two tone petals – in this case the darker shade is on top and backs are lighter. The individual flowers are not really photogenic, but the whole plant can be stunning. Why, then, did I take a bloom shot? One of life’s little mysteries. This flower looks to me like it should be smoking a pipe… if roses did that kind of thing. I like the way the petals are so tightly packed in these flowers – this is rosa ‘Port Sunlight’. The little rose bud is so sweet! 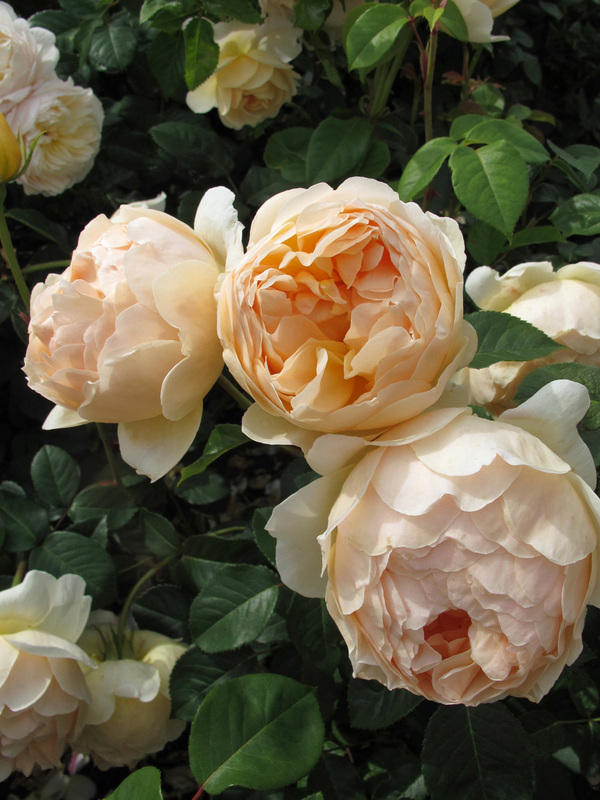 David Austin varieties often have round buds, rather than slim ones, but these buds give little warning of all the petals that are mysteriously going to appear. 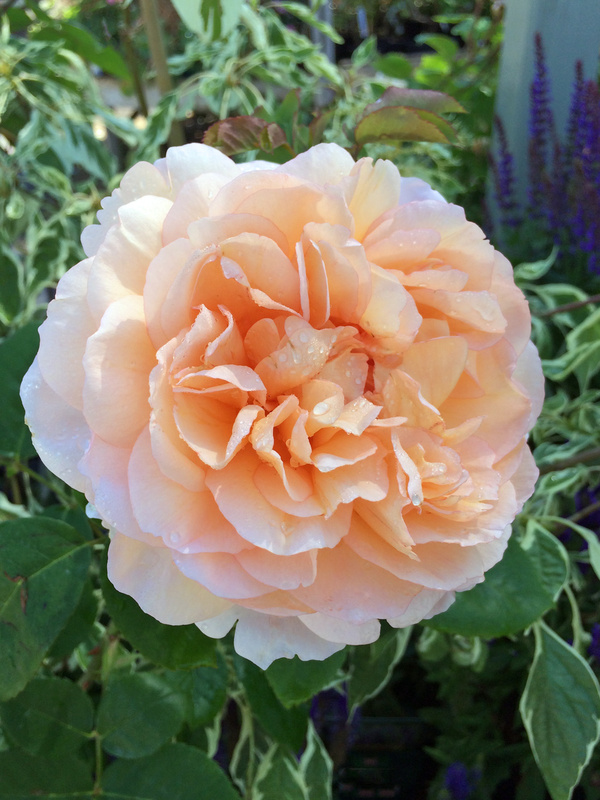 This English rose really could have gone with the pinks as that’s how the flowers eventually end up, but I think it’s ‘Leander’, an older David Austin variety, generally classified as an apricot. I could be wrong! 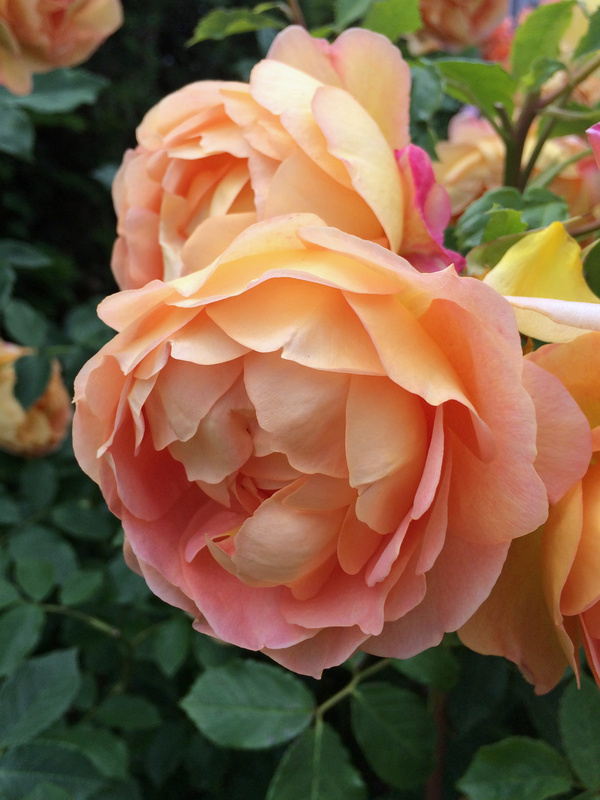 I got a bumper harvest of pictures of rosa ‘Lady Emma Hamilton’ (above) this year – I must have caught it at its peak. If you’re as intrigued by the warm colouring as I am, you might enjoy browsing through the gallery of pictures of Lady Emma Hamilton I shared earlier this summer. 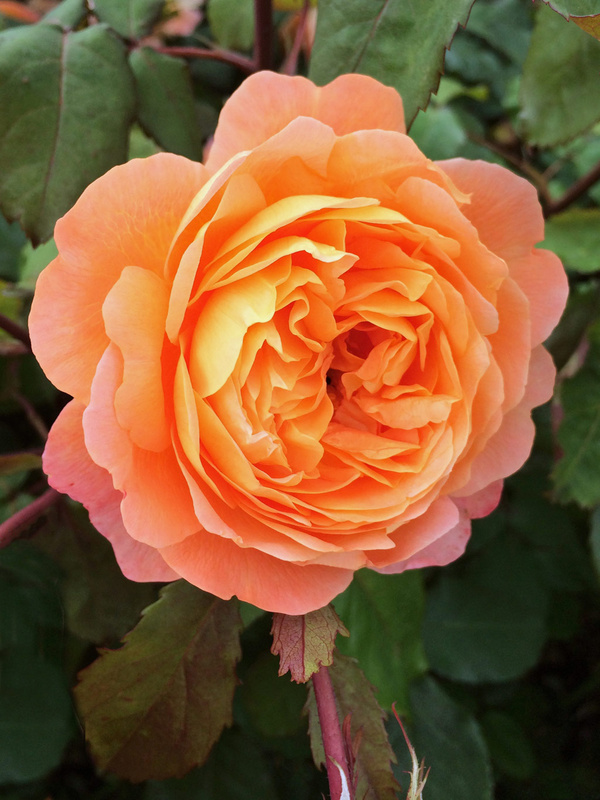 Finally I’ll sign off with a bow from an old favourite of mine: rosa ‘Crown Princess Margareta’. It’s not a classic mugshot, but I like it all the same – it gives a good impression of the fullness of the flowers. This is number two in a planned series of four colour-themed galleries. If you love yellow roses and missed out on my first post, you’ll find it here. A wonderful display Susan. All taken at their peak. 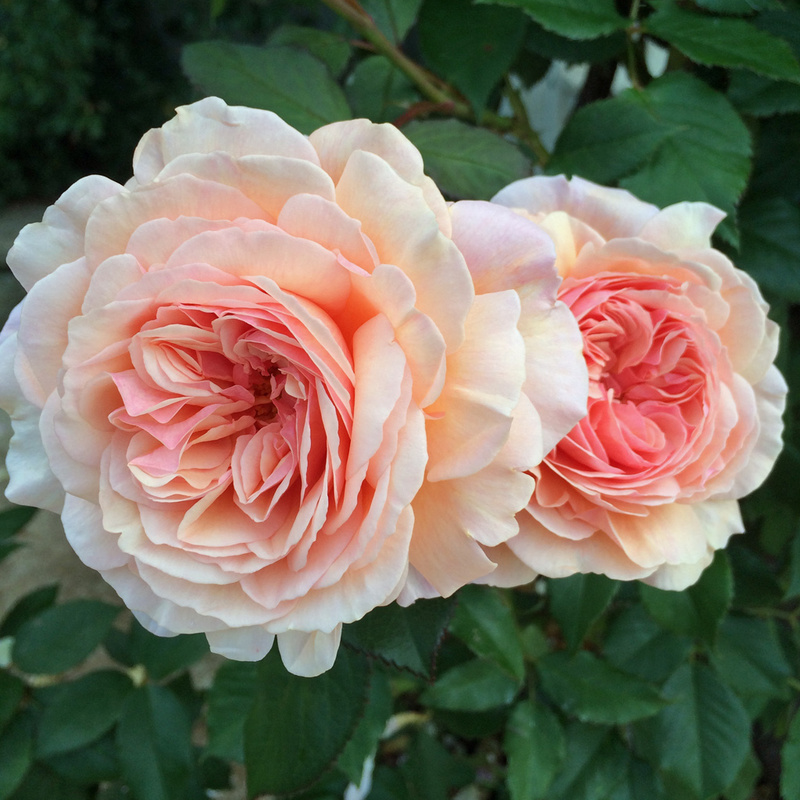 We have A Shropshire Lad, Lady Emma Hamilton, and Crown Princess Margareta. It was fun checking them off. Stunning! The David Austen catalogue came in the post yesterday. I thought it was the most gorgeous catalogue I had ever seen but your photos are equally gorgeous. I wish I had your skill for capturing the transient beauty of these flowers. I’m glad you enjoyed them, but I think you’re being too modest. 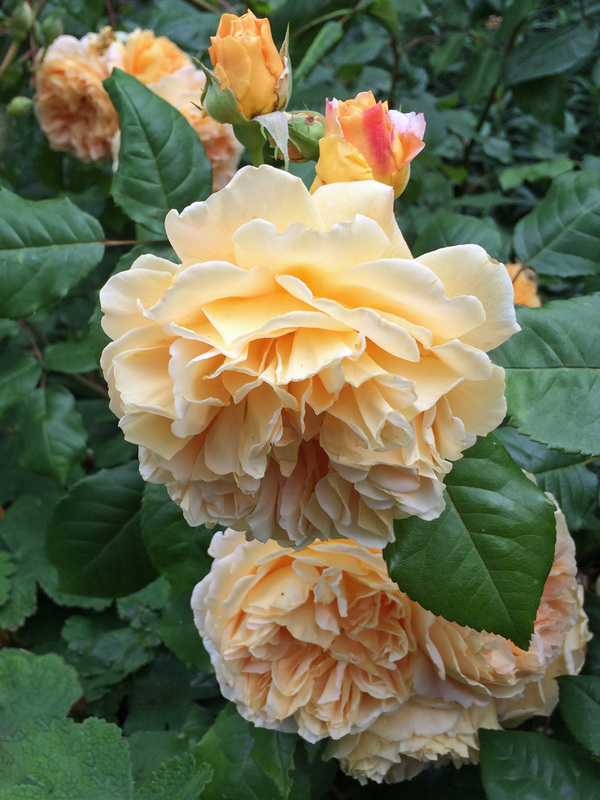 I spotted a beautiful yellow rose on your latest post (perhaps Golden Celebration?). Aha! Eagle-eyed! It’s Graham Thomas; what a performer! Your photographs made my head swim — now, I feel dizzy and drunk, like a bee. These are a testimony not only to your beautiful photography, and discerning eye, but also to your exquisite gardening skills. You’re very kind – I only grow one of these roses, sadly, but I take pictures on my travels, wherever I spot them. My two rose bushes are pathetic things, and I plan to do better by them, and also to look for some fragrant, climbing roses to plant. Alas, the prettier they are, the less fragrant they seem to be in many cases. English roses seem to be lovely, though. 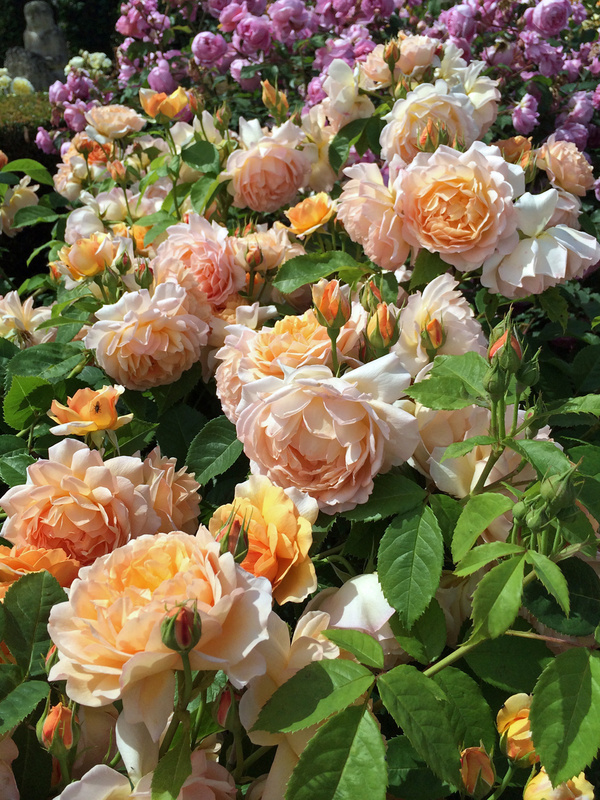 Have you seen the new rose bed at the Savill Garden at Windsor? If not, add it to your rambles next time you’re nearby. 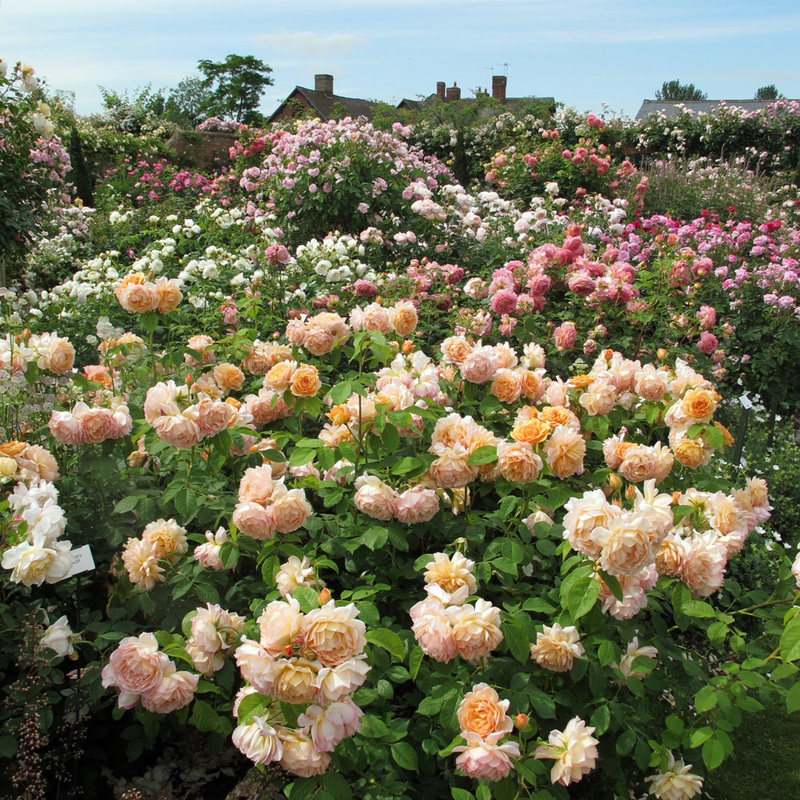 The roses are planted in a swirl, with an elevated viewing platform that juts into the design. Light color roses are positioned at the far reaches and the darkest at the center. It’s a great use of roses in a contemporary design…and lovely! That’s a great description. I saw it a couple of years ago but tantalisingly just before the first peak of flowering, as thousands of buds. I have a few pictures somewhere. I imagine it would be breathtaking at its peak. I spoke to a member of the team who explained they have got deadheading off to a T so they can keep it flowering in one long flush. I was fascinated by that idea: it’s a big ask and I’ve never seen that being done before. You usually expect a resting period between flushes. I can’t imagine how they’d do it at the widest part of the beds. It certainly looked great three weeks ago! It was the best group of roses we saw. 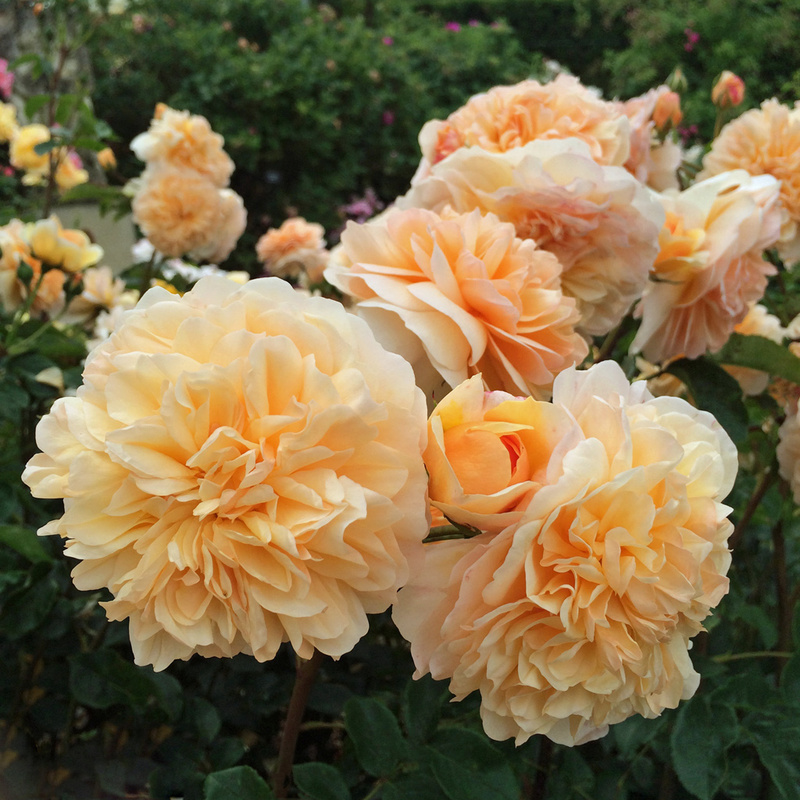 See, I was convinced that I didn’t like yellow/apricot roses until I saw some of these photos. Lady Emma Hamilton is pretty stunning. Beautiful! Thank you for these lovely photos. And your selections could not have been more timely for me! We had several David Austin roses at our former home, but sadly there were none here when we moved into our current home 2 years ago. I just ordered several bare root plants a few weeks ago (because I missed them so much) – and all of them in the yellow/apricot range! Lady Emma Hamilton, Grace, and Lady of Shallot were among my selections. Thank you for providing me with such a wonderful preview!